While insects are the most familiar pollinators of flowers, other animals, such as small marsupials and birds also get in on the act. On our block, the Eastern Pygmy-possum (Cercartetus nanas) and the dasyurid Antechinus agilis inadvertently transfer pollen between Banksia spinulosa plants as they feed on the flowers. The Eastern Spinebill gets dusted with pollen when it thrusts its beak into Persoonia, Correa, Epacris, Banksia and other flowers in search of nectar. Australian wattles, on the other hand, appear poorly suited to pollination by birds. The tiny wattle flower lacks the tubular shape typical of bird-pollinated species and it does not produce nectar. Nonetheless, one species of wattle - Acacia terminalis (Sunshine Wattle) - has found a way of using birds for pollination. About 20 years ago, researchers at the Botany Department, University of Melbourne discovered how (Knox et al., 1985). Nectary on a petiole of A. terminalis. Note the nearby flowers. A. terminalis secretes nectar rich in sugars and amino acids from a specialised gland on the petiole, the leaf stem. 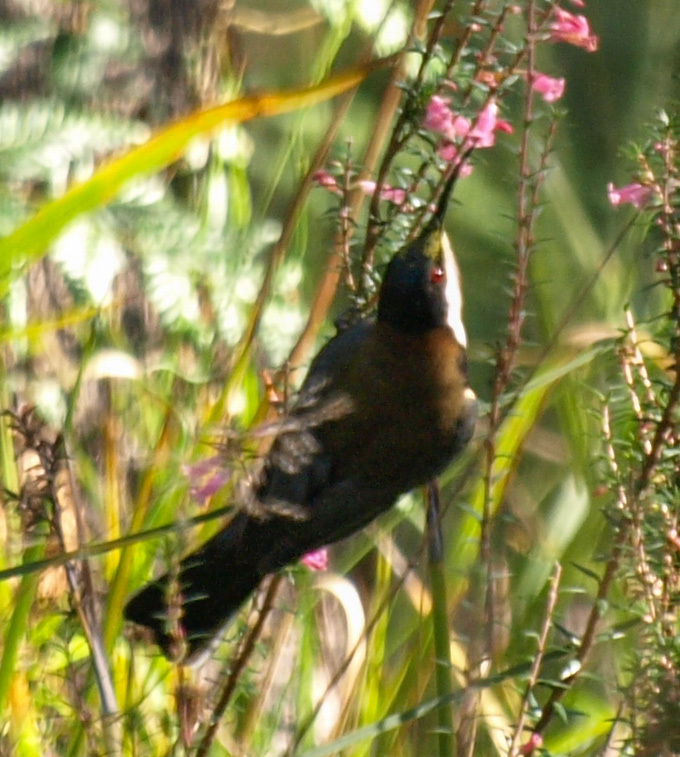 A number of small birds, including the Brown Thornbill, Striated Thornbill and Eastern Spinebill regularly forage nectar from these glands. As the twigs on which they are standing bend, the birds are often daubed with pollen from nearby flowers. When they fly to another A. terminalis plant to feed, they transfer that pollen to female parts of flowers on that plant. Bingo - pollination! These small birds play a key role in pollination of A. terminalis because this wattle flowers in Autumn, when there are relatively few insect pollinators around. Conversely, the birds benefit from an energy and nutrient rich food source at a time of the year when few other plants are flowering and insect prey are few and far between. A win-win situation!